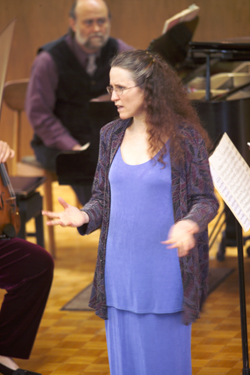 Photo: West Coast Chamber Music artists’ friendly commentary with the audience is always well appreciated. This wind, string and piano concert presents two duos in the rich Germanic tradition. Robert Schumann’s Three Romances for Oboe and Piano, Op.94 offer beautiful and graceful intertwining melodies, while Johannes Brahms’ Sonata for Viola and Piano in F minor, Op.120, No.1 is stirring, dramatic and expansive. Three come together in Francis Poulenc’s colourful Trio for Piano, Oboe and Bassoon. This music is jovial, energetic and bright in tone, and quintessentially French. The Two Rhapsodies for Oboe, Viola and Piano by Charles Martin Loeffler written in the French tradition, is impressionistic with freely flowing contrasts in timbre and texture. Purchase info on the Ticket Information page.